Thanks so much to Dan Murray for this awesome report – a great read!! Sorry I have taken so long to get it posted. “I never knew that an empty drink cup could be so hazardous,” commented my friend, Kris. We were all tired, sitting in a crowded meal hall that was full of tired ski racers. It was mid afternoon in Mora, Sweden. Kris’s comment about rogue cups was one of many stories being shared that afternoon after we had completed the legendary Vasaloppet, an epic 90 km cross country ski race that attracts almost 16000 participants every year. Rogue drinking cups reflect the immensity of the Vasaloppet. 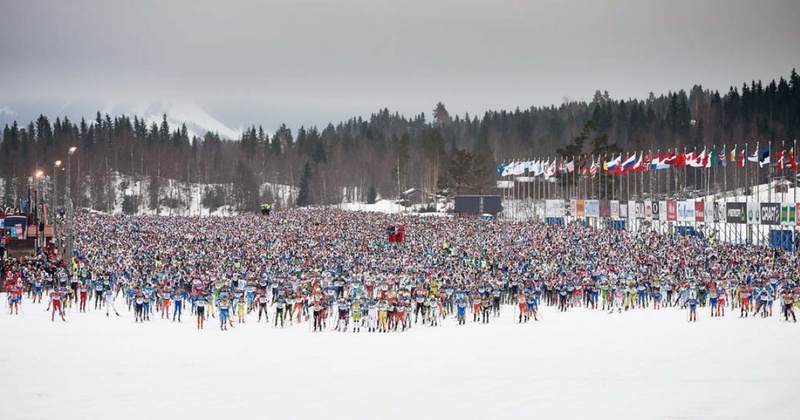 Imagine the scene at a feed station at the biggest ski race in the world, where a few thousand skiers have passed through, all casting their cups aside…..so many that a dozen or so volunteers with rakes can barely stay ahead of the litter. This would seem harmless, until you consider that most skiers have the stickiest substance known to humanity, klister, on the bottom of their skis. The endless sea of empty cups inevitably found the occasional ski, resulting in comedic crashes and/or awkward manoeuvering as skiers clumsily tried to remove an adhered cup. It’s all downhill from here…..right? 1 km of flat + 2 km of climbing (approx. 200m vertical) brings one to the top of the course. After that, the elevation gradually goes down. Here are Ian, Kris & I during some trail inspection near the start. 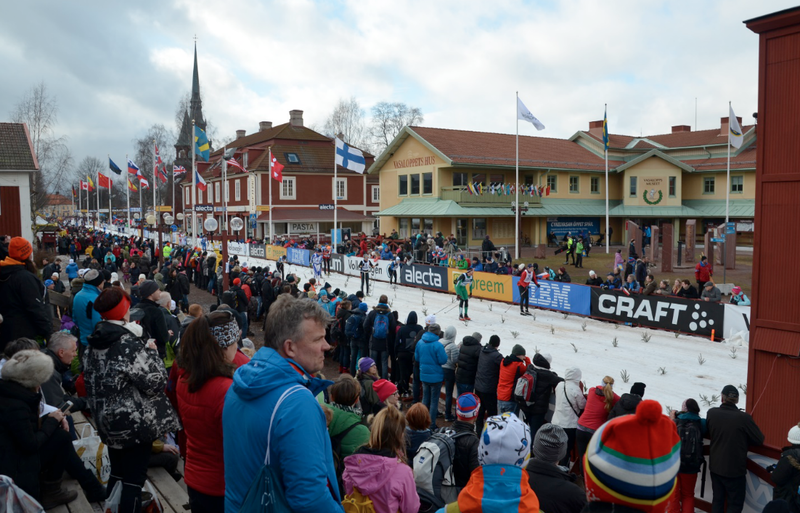 The Vasaloppet remains to one of the most popular and prestigious ski races in the world. It roughly traces the route of a nobleman (eventually king), Gustav Vasa, who skied 90 km between Salen and Mora to start a revolution that eventually led to Swedish independence from Denmark during the 16th century. Vasa’s legacy is celebrated alongside Sweden’s national sport, cross country skiing, as thousands of participants line up every year for the grueling trek through the Swedish taiga. This year, word amongst the veterans was that this was one of the toughest Vasaloppets in history, due to temperatures that hadn’t been below zero for more than 24 hours and a warmer winter than usual. This made for tricky snow conditions, in particular to the final 10-14 km which mostly had to be trucked in from somewhere else. As the race drew closer to Mora, the conditions became warmer, wetter, and increasingly man made. 2015 is the first time that the Vasa has been invaded by those of Cape Breton blood. I was joined by my brother Ian, good friend Kris Doyon, plus my sister, Heather who tagged along to provide feeds and moral support. Our races were sub par due to poor skis, yet the experience itself outweighed any of our selfish ambitions. It would be great to describe the day in detail, but I’ll keep things reader friendly. Some highlights of the Vasa that stand out in my memory are as follows. How big is the Vasaloppet? A few thousand more volunteer. The Vasaloppet is televised live on Swedish national television to a few million viewers. Television coverage was filmed with helicopters, snowmobiles, drones, and many reporters along the course. When Swedes win the Vasaloppet, they are national heros. Every walk of life participates…..from seasoned pros to folks who obviously ski less than 10 times/year. The amount of energy the start, along the track and at the finish is indescribable. 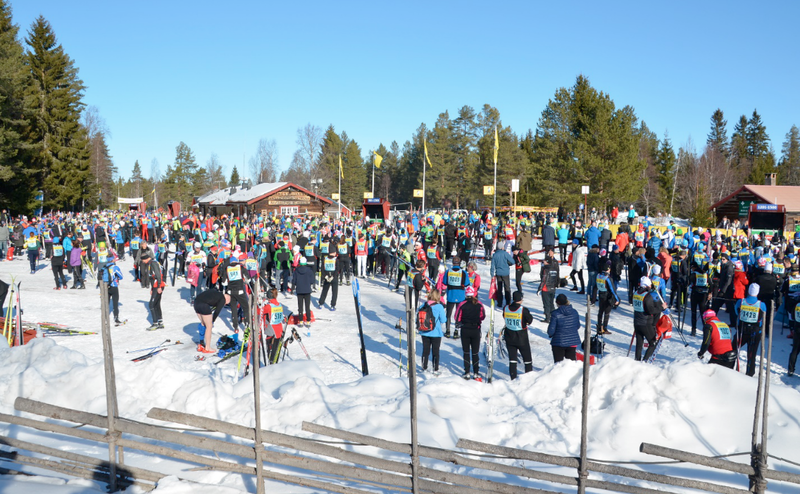 A typical scene at a Vasaloppet feed station. 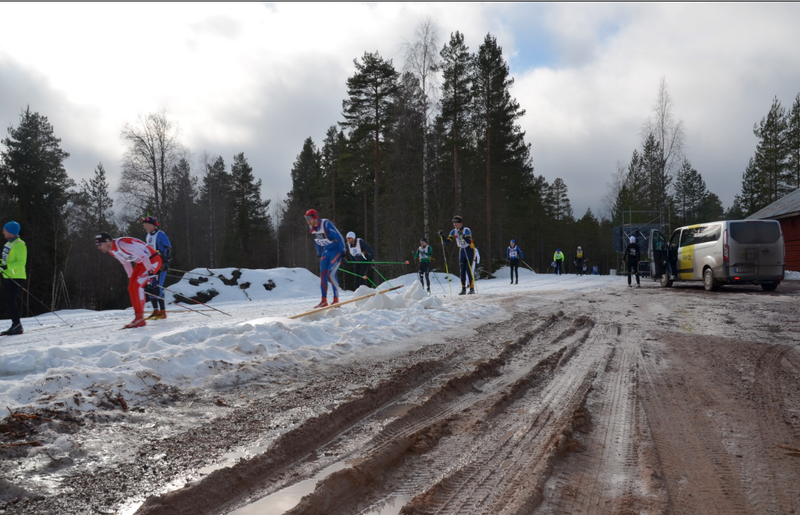 Please note this picture was taken 2 days before the race, during the Vasastaffen (Vasaloppet Relay). The format of the day may have been slightly different, the scene was basically the same as during the Vasa……very, very busy. How wet was it this year?! Most of the tracks of wave 3 were underwater. Many sections of the course were under water. Sometimes streams of water were running down the tracks. Hard. 90 km of slow skiing in soft conditions made this the most epic ski race that I’ve ever done. This didn’t stop many tough guys and gals from double poling the whole thing. The ‘small’ hill near the start (~200 vertical over 2 km) may slow them down early, yet allow them to fly through the remaining 87 kilometers that gradually roll downhill. Ian was one of those tough people. Kris and I were not. People, People, People. I’m used to skiing in Nova Scotia where I actually spend a lot of time alone. The Vasa was a never ending stream of skiers, from start to finish. At times, it was great to be part of the flow. However, a few times when the mind and body were weary, the incessant sounds of skis sliding and poles slopping through the snow had a slight flavor of an Alfred Hitchcock film. Busy. The logistics of sorting out race kits, testing wax, waxing skis and buying food is more challenging when the race is spread over 90 km in a straight line. Throw in the fact that only one road connects Salen & Mora and everyone else doing the same thing as us (i.e. lots of traffic). And then there was jet lag too. A celebration of skiing. Everything was about skiing. There were massive ski expos at the start and finish, numerous waxing services, thousands of spectators, etc. Finally, as a nice touch, on race morning, the roads to the Vasa were lined with candles each time they passed through a community. Kris Doyon- 6:31:07 (2509th Place)…..note, Kris was fairly sick when he raced. As tough as the day was, we all drove home that evening with a strong sense of satisfaction and exhilaration, despite the fact that fatigue permeated our minds. It was magical to participate in an event that celebrates a nation’s existence with a participation based sporting event. 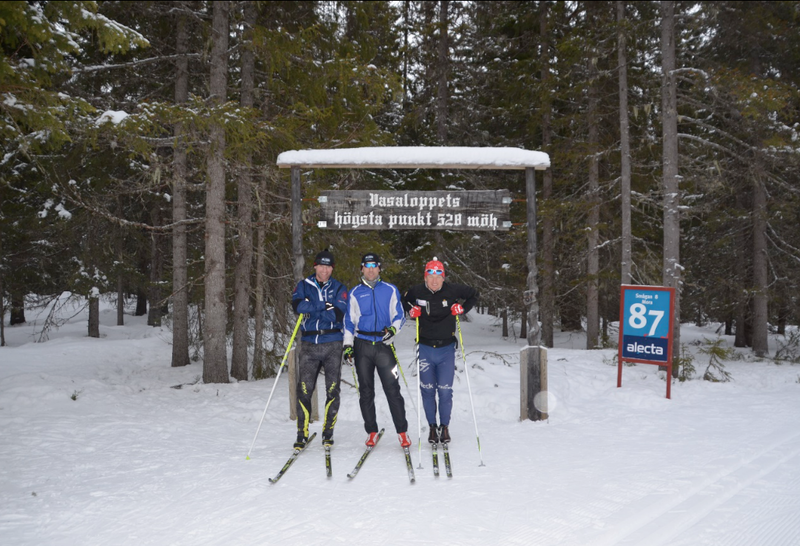 It was more than an accomplishment to finish the Vasaloppet, it was a being able to participate in living history. If you want to feel the pulse of Sweden, do the Vasaloppet.